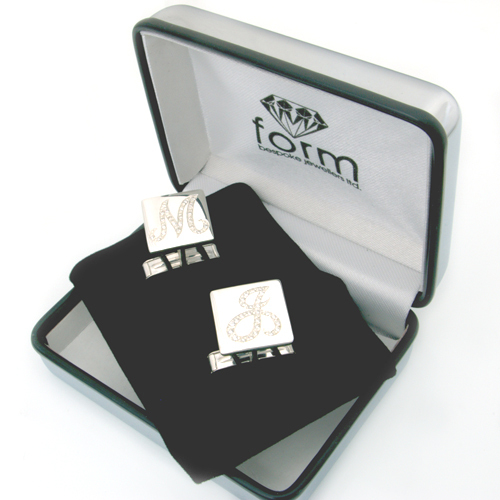 Brilliante Silver Diamond Set Cufflinks — Form Bespoke Jewellers Ltd. These diamond set cufflinks use Brilliante silver. ‘Brilliante’ Silver is unlike ordinary silvers. It is highly tarnish-resistant needing significantly less aftercare to keep it shining brightly. Once the cufflinks were cast in this Brilliante silver, they were hand engraved to create the outer lines and shape of the initials. Beautiful round brilliant cut diamonds, which taper in size, were then grain set through the initials. All the diamonds were hand set by one of our expert Yorkshire jewellers in our Chapel Allerton workshop. We are very proud of our British craftsmanship and always ensure the best quality with our bespoke fine jewellery. The cufflinks were also hand finished and polished by our Yorkshire workshop. If you are feeling inspired by these cufflinks, we could create a bespoke pair for you. Similar cufflinks could be set with colour precious stones or with an alternative engraved design. As a bespoke jewellers, we can create almost any jewellery piece, you just have to ask!